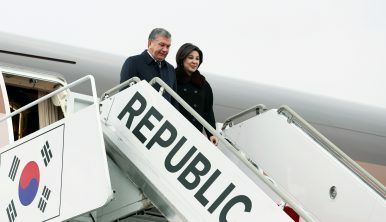 President Mirziyoyev arrives in South Korea for his state visit. Uzbek President Mirziyoyev’s state visit was a nod to South Korea’s growing role in the region. South Korea does not usually come to mind when pondering the geopolitical showdown between great powers for primacy in Central Asia. China’s Belt and Road and Russia’s Eurasian Economic Union overwhelmingly dominate discussions over the future of the Eurasian economic landscape. Nevertheless, Uzbek President Shavkat Mirziyoyev’s state visit to Seoul from from November 22 to 25 demonstrates that South Korea, geographically disconnected and lacking in overt historic influence in Central Asia, is rising as an economic player in the region. Under Mirziyoyev, Uzbekistan has set about reshaping relations with other Central Asian states, and even setting itself up as a regional leader. A report produced by Johns Hopkins University notes that Uzbekistan’s trade with its Central Asian neighbors grew by 13 percent in the first half of 2017. Closer economic ties with Uzbekistan, therefore, have the potential to increase South Korea’s economic presence in Central Asia as a whole. During the South Korea-Uzbekistan summit, South Korea’s president Moon Jae-in referred to Uzbekistan as a “key state” in Seoul’s plans to expand its role as a player across the Eurasian landmass. South Korean media originally reported that Mirziyoyev was due to address the Republic of Korea National Assembly, although later the Uzbek government reportedly canceled the scheduled speech. Even though the planned speech fell through, one must not underestimate the significance behind Mirziyoyev’s invitation to address the National Assembly for South Korea-Uzbekistan relations. Given South Korea’s deficiency in power and influence in Central Asia as a whole relative to Beijing and Moscow’s clout, Seoul’s Central Asia strategy is best executed by developing bilateral relationships with individual states. While Seoul lacks the clout to influence the outcome of geopolitical and economic events in the region, South Korea, with its underwhelming size compared to China and Russia, enjoys the ability to offer Central Asian states such as Uzbekistan economic opportunities without appearing to be a threat against national sovereignty. Seoul and Tashkent have approached the newest developments in their bilateral trade relations from a strong basis. South Korea is one of the top five sources of Uzbekistan’s imports. South Korean economic ties with Uzbek organizations and firms have largely been government-led, unlike economic relations with South Korea’s other main partner in Central Asia, Kazakhstan, which has been spearheaded largely by private firms. For South Korea, deepening cooperation with Uzbekistan represents a mix of both risks and opportunities. According to an assessment of the Uzbek national economy by the U.S.-based Heritage Foundation, imports and exports account for only 43 percent of Uzbekistan’s GDP, which may indicate a lack of opportunities for the export-intensive South Korean economy to benefit from substantial trade with Uzbekistan. As Uzbekistan divides its import and export partners among various countries such as Kazakhstan and Russia, South Korea will face challenges in expanding its niche of the Uzbek GDP derived from foreign trade. A UN report dating from 2015, however, highlights several positive factors for potential foreign investment in Uzbekistan, such as consistent high credit ratings from agencies such as Moody’s and Standard & Poors, as well as Uzbekistan’s diversified economy, especially when compared with other states in the region. On the first day of Mirziyoyev’s visit to Seoul, the South Korean and Uzbek sides signed a slew of deals totaling just short of $9 billion. The deals focused primarily on energy, banking, and infrastructure. Among the specific deals cited in Uzbek media was a deal between South Korea’s Export-Import Bank (KEXIM), which manages a South Korean fund for projects in developing countries, and Uzbekistan’s Uzpromstroibank, to triple the former’s credit line for the latter from $10 million to $30 million. Uzbekistan Ozbekyengilsanoat, a state-owned joint stock company focused on producing textile goods, also agreed to export $70 million worth of goods to some of South Korea’s largest retail corporations, including the Lotte Group. In addition to developments in South Korea-Uzbekistan bilateral trade ties, the two state’s economic ministers also signed a “road map” memorandum whereby South Korea offered to help Uzbekistan in its efforts to accede to the World Trade Organization. Uzbekistan’s working party (a group of countries multilaterally negotiating for a specific country) for WTO membership is currently chaired by Seokyoung Choi, a former South Korean career diplomat. South Korea has neither the macro-level influence nor great power aspirations that China and Russia do in Central Asia. Yet by wisely focusing on developing bilateral relations with Uzbekistan, Seoul is working to assure itself a place in the grand Eurasian economic chessboard. In so doing, South Korea is making headway in benefiting from a larger economic presence in Central Asia, in a way that does not threaten Beijing and Moscow’s geopolitical interests in the region as a whole. Anthony V. Rinna is a Eurasia analyst with Sino-NK. He currently lives in South Korea. The strength of relations between the two countries is intriguing.